The horizontal member of all the batter boards should now be at the same elevation above sea level. 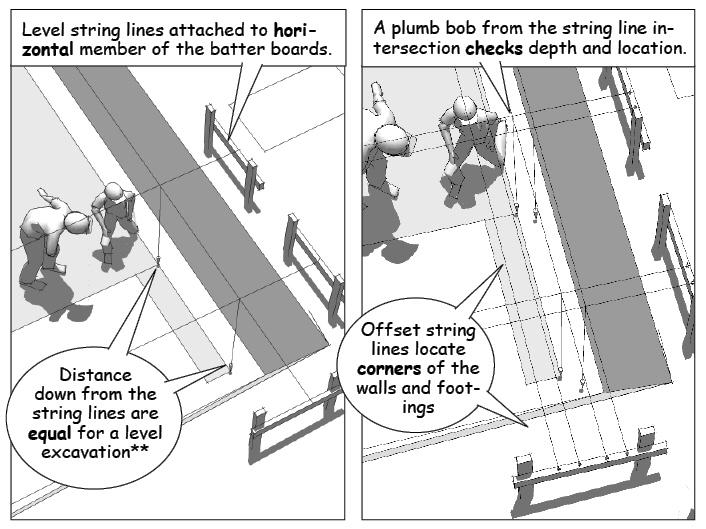 This means the string lines attached to these batter boards can be used as a vertical reference to check the depth of the cut, in addition to locating the critical corners and bearing points for the foundation. 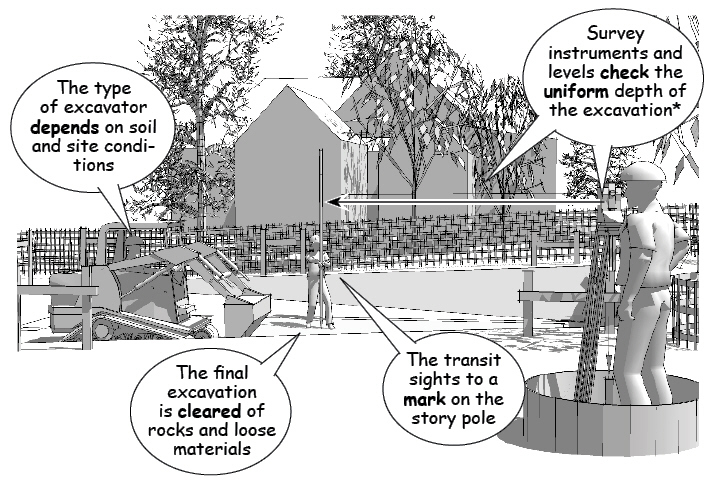 To save time, most builders use a fixed or transit/level to monitor progress and control the quality of the excavation. This survey instrument is set up over the workpoint so its scope remains level through 360 degrees of rotation (see this Tom Duffy video). 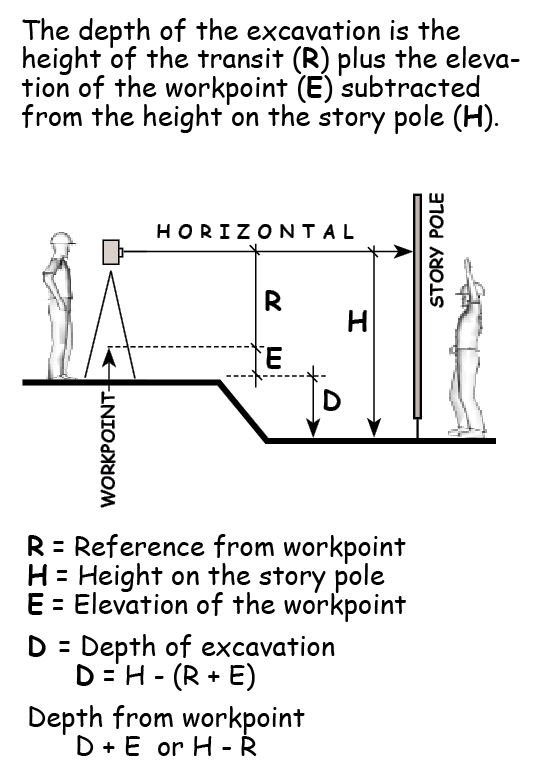 Since the height above the workpoint is now constant, the scope can be aimed at a surveyor’s story pole, first to get an elevation for the existing grade at that point, then to check the depth of any cut by calculating the relative measurements on the story pole. The idea is to avoid taking out more material than is absolutely necessary to comply with the requirements for the foundation on of the construction drawings. 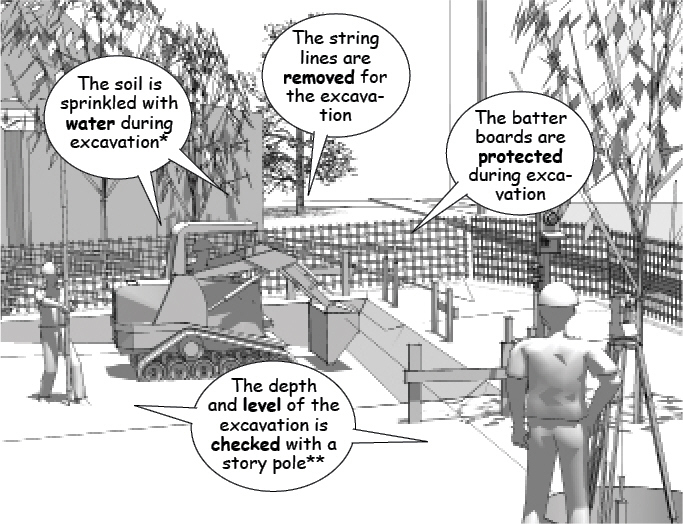 Removing too much material means it would have to be replaced as backfill or transported off the site an extra cost. The size and depth of the cut is based on the requirements specified on the construction drawings. These dimensions are shown as a sea level elevation on the civil engineering drawings and transferred as a reference zero point – usually set as the top of the finished floor. 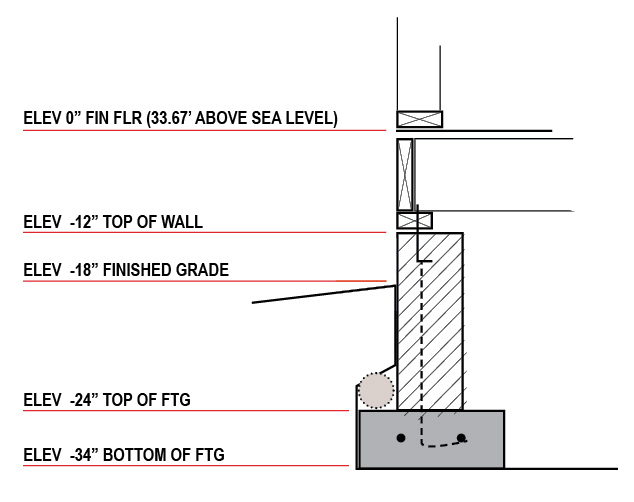 A typical wall section shows the depth of the excavation from this zero point to the relative heights of foundation stem walls, footings, and the total thickness of the structure supporting the finished floor. The height of the structural framing, finished grades, walkways, and other site work are all referenced from this common zero point. 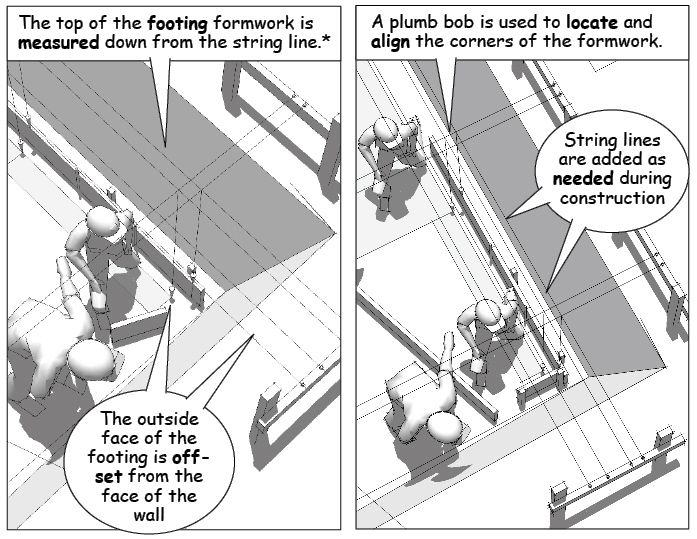 A plumb bob is used to transfer the location of the walls and bearing points from the string line intersections to the floor of the excavation and position the foundation formwork. The depth of the excavation and the top of the formwork are then measured vertically from the string lines, and the corresponding horizontal members of the batter boards. Important is that an accurately placed and level excavation sets the stage for masons and concrete workers, so that they can build the foundation according to their original contract estimates. If the cut is misplaced, too deep, or irregular, it means additional labor and materials, schedule delays, and a possible change order.